Looks like the C3yoyodesign Krown is getting an upgrade! Check out this teaser video for the Ryuichi Nakamura edition Krown.st 7075, and stay tuned for more details on this new release. C3yoyodesign Presents! Ryuichi Nakamura – “KROWN.st 7075” !!! Team C3 Japan Shinya Kido signature “KROWN” as the first generation 7075 flagship model, Shinya provided the high performance blueprint of 7075 yoyo. Lots of player around the world including our teammate Shion and Ryuichi enjoy using first generation “KROWN”. BUT Shion and Ryuichi no longer satisfied with “KROWN” (original). That’s why Shion got “RADIUS”. “KROWN.st 7075” upgraded to 7075 body and new rim design. Stay-tuned for more information. And NOW, Ryuichi got his new up-to-stand weapon for showing his TRUE POWER – THE BRAND NEW “KROWN.st 7075”!!! C3YoYoDesign has added some new talent to their “Rising Force” junior team…Japanese player Ryuichi Nakamura! Congrats to Ryuichi-san and C3YoYoDesign! This new promo video for Ryuichi definitely gives us a look at great things to come. 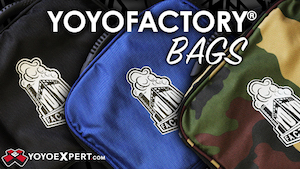 C3YoYoDesign really has one of the best teams around, and World Champion Shinya Kido proves it in this latest video. Showcasing the kind of fast, clean, picture-perfect play that Japan has become famous for, Shinya-san wrecks it in this promo video for YoYo Store Rewind. 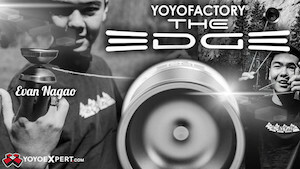 Yoyo used is Shinya Kido’s signature model, the Krown by C3YoYoDesign. Mihai Christian Suster rocks out a great video part with his newest release, KROWNonation. It was actually filmed this past summer, but got delayed a bit…looks like it was worth the wait, though! Yoyo used is the KROWN by C3YoYoDesign, along with Fat Neon Yellow Kitty Strings, a KonKave bearing, and IrPads. 2009 World YoYo Champion Shinya Kido has joined C3YoYoDesign, and today they’ve released a new video to show off his upcoming signature model, the Krown. Great tricks from Shinya-san, and congratulations again to C3YoYoDesign on a fantastic addition to their team! Shinya Kido joins C3YoYoDesign, debuts a new signature yo-yo! The contest has barely started and the news from Japan are already coming in hot! 2009 World Champion Shinya Kido has just announced his admittance into the ever-growing Hong Kong powerhouse team! The Krown is a full-sized yo-yo, weighting in at 65.5 grams, 56mm diameter, and 45mm width, and built in 7075 aluminum. The shape and specs leave no doubt about what should be obvious from such a partnership: a 100% competition-focused yo-yo. The Krown is being released at Japan Nationals this weekend!